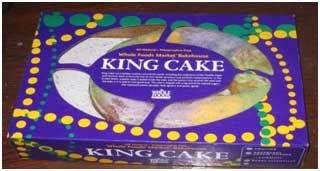 Since I supported the Saints and read about Mardi gras and King cake on Twitter, I picked up a King Cake for Mardi gras. When I got on the train, a woman from New Orleans was like “wow” what a coincidence. This took place in the middle of a slushy snowstorm and I was grateful to get home a little damp but in one piece. I am also not feeling too well and hope to shake off this bug soon. On Tuesday, two people asked me to speak to their groups about job searching in this economy and my term limits thesis. Whoa! I wasn’t expecting that but that is how opportunities happen when you don’t expect them or when others see something that you can bring to the table even if you don’t see yourself in that way; God’s always got a plan! Thankfully I have one 6 week online class that is officially over this week! My Social Problems class was amazing and informative; the topics were timely and hard at times…reading about 9/11 brought me to tears..I was reliving the terror all over again. That’s why Sociology is a great major; it deals with matters like terrorism and national security from a realistic standpoint. The online class discussion board is great; you can go back and read postings; its gives you pause and a boost at times! Our last topic deals with why Sociologists are left out of policy making…because we ask for changes that go against the status quo! That is me, the subversive that quotes Malcolm X and wears a black beret to City Council Hearings. Education opens our eyes and broadens our thought horizon so we can see what is really going on…kinda sounds like the Matrix doesn’t it??? My final is done; my score? A 93! WooHoo! The end of this class will leave me with the Seminar class to focus on and my professor said she will push us to the finish line and we’ll end up with something we can be proud of. I agree with her, it’s lots of research and asking questions; but it goes well with my insomnia. ← Testing, testing…1, 2, 3!